Anton Zouplna is our email newsletter trivia winner this time. Congrats! Name an Apollo Mission that was in orbit during Christmas. sign up for the email newsletter and have a chance to win prizes, too. Coffee at the Cosmo on Thursday, December 16, is entitled, “Barbie Loves Buzz: Space Toys.” It is at 9 a.m. at the Cosmosphere and is free and open to the public. One of Barbie’s careers was as an Astronaut, Snoopy was the first beagle on the moon – arriving months before man got there, and Buzz Lightyear is travelling to infinity and beyond. Since the earliest days of the space program, toys have been a part of the pop-culture representations. You’ll have a chance to look at toys from the last five decades and see how space-themed toys have fueled the imagination. Coffee at the Cosmo on Thursday, November 18, is entitled, “To Boldly Go Where No Product Has Gone Before: Brand Names in Space.” It is at 9 a.m. at the Cosmosphere and is free and open to the public. Tang and Velcro weren’t the only brand name products that flew into space. You might have items on your pantry shelves that bear the same names as those that made it into orbit. Learn about some of them, and get a look at artifacts not currently on display. “A Christmas Carol,” starring Jim Carrey, is the holiday movie at the Cosmosphere’s Carey IMAX dome theater. This classic has been reinterpreted with some Disney magic, but is still the heartwarming story we all know. It opens Friday, November 26. Charles Dickens’ beloved tale is a great way to make memories this season for the whole family. When three ghosts take penny-pinching Scrooge on an eye-opening journey, he discovers the true meaning of Christmas -- but he must act on it before it's too late. Even if you’ve seen this before, being surrounded by it in the dome will be a new experience. 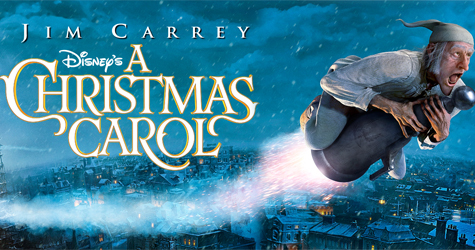 “A Christmas Carol” is timeless, and perfect for all ages. Make a holiday movie at the Cosmosphere part of your family tradition.